Today’s post looks at Big Data’s role in crime solving. Police in Raleigh, North Carolina, sometimes use Google data to investigate crimes. They are not the only law enforcement agency to do so. Austin, Texas police were able to obtain information from Google in order to trap the 24-year-old man who was sending incendiary devices around the city. Google’s most recent transparency report shows that there were about 5,200 search warrants requesting user information in the U.S. in the first half of 2017, an all-time high. User information requested through subpoenas and other court orders accounted for more than twice that number. The company produced at least some data in response to requests in the first of half of 2017 about 81 percent of the time. Google declined to say whether it released data in any of the Raleigh cases, and it’s unclear from the search warrants exactly what information was seized or whether it’s been effective in moving the investigations forward. Of the four cases, only one has resulted in an arrest. Tyron D. Cooper was charged Oct. 13 with the murder of [Nwabu] Efobi, the taxi driver gunned down in east Raleigh. But the related search warrant shows data wasn’t received from Google until months later. Cooper’s attorney, Christian Dysart, declined to comment on the case. Two issues are at play here. The first is the amount of data people inadvertently give Google via their accounts and GPS. The second surrounds the manner in which the data are requested. immensely valuable to Google, one of the reasons the company collects and stores the information on users of both its Android operating system and, in some cases, mobile apps such as Gmail. “From an average smartphone user’s perspective, it’s a little surprising once you start to learn the full scope of information about our locations and whereabouts and activities that companies like Google hold,” said Nathan Freed Wessler, staff attorney with the American Civil Liberties Union’s Speech, Privacy and Technology Project. Users can switch location tracking off to prevent the device from pinging GPS satellites. But if it’s on a cellular network or connected to Wi-Fi, the device is still transmitting its coordinates to third parties, even if they’re far less accurate than GPS. In the past, at least, turning off that technology has been no guarantee of privacy. Business and technology news site Quartz discovered late last year that Google continued to track devices even when all GPS, Wi-Fi and cell networks were supposedly disabled. The tech giant says it has updated its software to stop the practice. For its part, law enforcement makes frequent use of cellular network data to build cases. The demands Raleigh police issued for Google data described a 17-acre area that included both homes and businesses. In the Efobi homicide case, the cordon included dozens of units in the Washington Terrace complex near St. Augustine’s University. The account IDs aren’t limited to electronics running Android. The warrant includes any device running location-enabled Google apps, according to Raleigh Police Department spokeswoman Laura Hourigan. Hourigan said Raleigh police investigators use these search warrants on a case-by-case basis and consider Fourth Amendment protections against unreasonable search and seizure. “This technique is used in extraordinary circumstances because the department is aware of the privacy issues that the tactic raises,” she said in an email March 9.
targeting narrow areas and specific time windows. She points out that data investigators receive from Google contain only anonymized account numbers without any content included. “We’re not getting text messages or emails or phone calls without having to go through a different process and having additional information that might lead us to a specific individual,” Freeman said. After five years as a Wake County prosecutor, Raleigh defense attorney Steven Saad said he’s familiar with police demands for Google account data or cell tower records on a named suspect. But these area-based search warrants were new to him. Most modern phones, tablets and laptops have built-in location tracking that pings some combination of GPS, Wi-Fi and mobile networks to determine the device’s position. This is no doubt only the tip of the Big Data iceberg. We would probably be shocked if we knew the full story. Two new developments have emerged with regard the Parkland, Florida school shooting on Wednesday, February 14, 2018. We have a new police audio and a report about Nikolas Cruz’s past mental state. 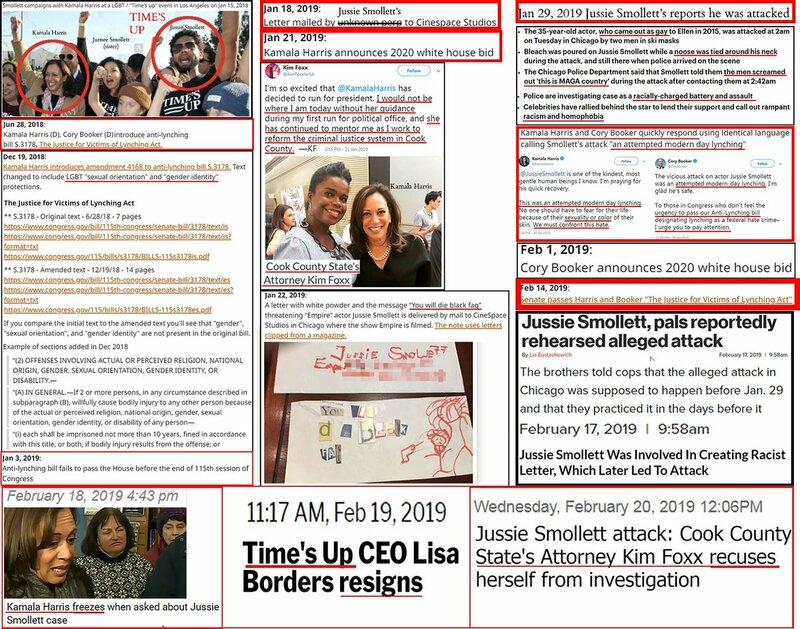 The article has more on the police timeline. Nearly four years before school shooter Nikolas Cruz gunned down 17 students and educators at a Parkland high school, he confided in a therapist that he saw himself in a dream drenched in human blood. The therapy files also underscore Cruz’s strong desire to be sent to a regular high school. He frequently discussed transferring with his therapist but also expressed anxiety about getting mainstreamed. In some sessions, the therapist described Cruz as “receptive” or noted that he’d had “positive” behavior at school. The therapist role-played with Cruz to teach him how to interact with his peers and avoid conflict. But following other sessions, the therapist noted troubling behavior at school and at home. Cruz, who was ordered held without bond Friday on the additional attempted murder counts, now faces the death penalty. He was never going to turn out well. What can be done with youngsters like this? What has been evolving out of the Valentine’s Day shooting in Parkland, Florida, beggars belief. I wasn’t even going to write about it, but decided to do so once people began clamouring for gun control and ignoring mental health issues, including the effect that SSRIs can have on the mind. I followed up with another post on the media attention certain young people received. Before I discuss two more contributing factors — lack of two-parent households as well as school and law enforcement policies for young people — let us look at the latest headlines in the aftermath of the shooting. CNN held a town hall broadcast with Florida senators Marco Rubio (R) and Bill Nelson (D) about gun control. A student from Marjory Stoneman Douglas High School, the scene of the crime, was in attendance and already had a question prepared. He claimed that CNN gave him a scripted question. Jalen also told Jones that there was a visit from the Secret Service four weeks prior to the shooting to train teachers in defence. That was also reported after the shooting took place. Why would the Secret Service do that sort of training, impose protocols and regular drills? That is not part of their function. Jalen said that the students were not allowed to leave — or call anyone to let them know what was happening — until later. Law enforcement showed up within just a few minutes. He also confirmed multiple shooters. In short, the official story line does not add up. The media can’t be bothered to talk about their victims because it’s politically inconvenient. Many of the perps are illegal aliens or undocumented beheaders. The victims aren’t people they could envision as their kids. And reporting on MS-13’s crimes endangers their push for illegal alien amnesty. It also shines a harsh light on the policies of Obama Inc.
Its worthy to note the 911 response time was in excess of 20 minutes. In fact, I was only contacted by a few reporters. The incident was basically ignored and squashed in fear of damaging the political establishment, school board, school superintendent, https://t.co/9uf8bIpBlj. Here are some answers for Mr Bouchell. Imagine what happens after an extended period of time? A mass shooting that could have been prevented if a twisted school/law enforcement policy had not been in place. Given that police visited Nikolas Cruz’s home at the request of his mother 39 times, had the system been left alone, he never would have been allowed to handle firearms. He probably would have had better mental health care, too. Nikolas Cruz was adopted. His adoptive father died when he was a boy. His mother, who was in her 60s when she died in November 2017, could not control him, hence the police visits. Instead of spending so much as fifteen minutes on fatherlessness we are forced to endure the same salacious headlines, the same provocative tweets, the same tired old memes about the evils of guns as if somehow a cold piece of metal convinced yet another boy to become a mass-murderer. We ignore the lack of adequate mental health services, the failure of law enforcement to effectively intercede, and the sickening impact fatherlessness has on each one of these tragic cases. Why? Because it is easier to ban a hunk of metal than it is to right systemic cultural wrongs. Single-parent homes are not serving society well. In Cruz’s case, one can understand that his mother might not have wanted to remarry. Perhaps her husband was the love of her life. However, it would have been good for her to get male role models for her sons in the form of a family friend or a relative. School boards are failing troubled teens by asking law enforcement to compromise proper procedures. Law enforcement officers are failing troubled teens by enabling bad behaviour in accordance with school board policies. More gun control is a bad idea. Europe is largely a gun free zone outside of police and criminals. Many European cities — e.g. Marseille — have turned into violent dumps where shoot-outs occur with alarming regularity. Criminals have no problems getting firearms. All of these factors make a heady brew for a mass shooting. Acrylic paint has several advantages, among them ease of use and quick drying time. Unfortunately, it isn’t very good for subtle tones. As a result, the finished canvas often looks sophomoric. However, for high school art classes, acrylic’s advantages outweigh the disadvantages. I’ve only ever seen two acrylic paintings that were any good. Both were by an amateur artist who exhibited them at an art fair in our area last year. The artist did well to paint on small canvases which allowed her to use the medium to its best advantage: achieving fine detail. That sounds contradictory, however, this lady’s paintings — one of a field of poppies, the other of daisies — were marvellous. She must have spent a lot of time on them, because all the leaves of grass were visible and natural, as were the dozens of flower petals. Both were pleasing to the eye and a joy to look at. It was clear the artist understood and had perfected her brush strokes with the medium. By contrast, I had a friend many years ago who painted large canvases with acrylic and achieved mediocre results for the most part. He was unable to properly blend one colour into another. That happens to most big-canvas acrylic artists who try to paint portraits or street scenes. Acrylic is best left for the abstract which requires dramatic colour and broad brush strokes. An example of an acrylic painting follows. Subject matter aside, the brush strokes need work, a common mistake. Art teachers really need to teach students more about brush control, particularly according to paint medium. The Cannon Tunnel, which connects the Cannon House Office Building to the Capitol Building in Washington DC, is home to an exhibit of artwork by American high school students, winners of the Congressional Art competition. The artwork changes every year. This photo shows part of the current selection, which, as you can see, is of high quality. I particularly like the masterful detail in the painting of the pair of shoes in the lower left hand corner. The other painting which is striking is the black Liberty in the upper right hand corner. That student understands brush control, texture and subtlety. The depiction of Ferguson, Missouri, comes so close. The technique holds it back. 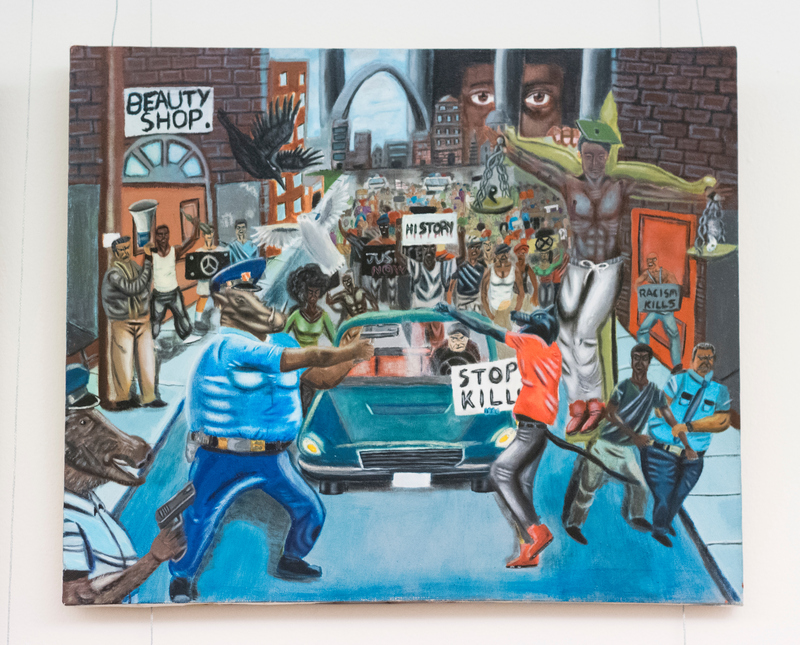 California Republican Rep. Duncan Hunter has removed from display in the Cannon tunnel the controversial student art contest painting of police-community relations in Ferguson, Missouri, that depicts police officers as animals. A Huffington Post reporter first tweeted a photograph of the empty space and said that Hunter removed it. Hunter took it upon himself to take down the painting, Washington Republican Rep. Dave Reichert’s office later confirmed. It was sponsored by Missouri Democratic Rep. William Lacy Clay, who had defended it. Reichert, who spent 33 years in law enforcement, had criticized the artwork earlier, and gave Hunter a phone call on Friday after finding out about the removal. One could make a case for both points of view. However, looking at the other Congressional Art winners on the wall, it does seem as if the painting was chosen for its subject matter rather than its artistry. Art teachers should spend the first few lessons teaching brush technique. A small canvas will help students greatly in developing the patience — and art — of working with acrylics. Instead, I suspect, they teach colour mixing, perspective and get the students to begin expressing themselves boldly straightaway. I arrived at this conclusion after attending an evening a few years ago with the since-deceased London Evening Standard art critic Brian Sewell who studied at the Courtauld. He told us that a university art student sought his advice about improving his painting. Sewell advised the student to buy finer brushes — the type used to achieve detail on feathers and fur — and really practice with them before committing to a working canvas. Sewell lamented the lack of today’s training even at Britain’s best art schools. The brushes are on sale, he said, but teachers ignore them, consequently, students are unaware of them. The instructors, he concluded, are not interested in teaching fine art. Moving on to Untitled #1‘s subject matter, it is surprising that, after two terms — eight years — of the nation’s first black president at the helm, America has such a racially divisive atmosphere, the likes of which have not been seen since the late 1960s when civil rights laws were just coming into existence. Michael Brown robbed a Ferguson, Missouri, convenience store of two handfuls of cigarillos just minutes before Officer Darren Wilson fatally shot him on Aug. 9, according to his friend Dorian Johnson’s testimony before a St. Louis County grand jury. Wilson testified Brown’s possession of the cigarillos was the impetus behind the encounter that ultimately led to his death. Wilson avoided indictment on criminal charges Monday after the grand jury decided there was a lack of probable cause to suggest that he committed a crime. The decision generated widespread outrage, particularly in Ferguson, where police used tear gas to subdue crowds that started fires and destroyed property. Johnson testified Wilson initiated physical contact, that he never saw Brown throw a punch and that Brown was outside the police cruiser when Wilson shot him. Obama could have also explained that the average citizen looks at each police incident as an isolated event. By contrast, law enforcement officers see things differently. They encounter criminals or strange situations all the time. It’s what they do. They are trained professionals. While Brown did not use a gun on Wilson at the SUV, his aggressive actions would have given Wilson reason to at least question whether he might be armed, as would his subsequent forward advance and reach toward his waistband. This is especially so in light of the rapidly-evolving nature of the incident. Wilson did not have time to determine whether Brown had a gun and was not required to risk being shot himself in order to make a more definitive assessment. as a result of cops being more reluctant to police neighborhoods out of fear of being labeled as racists. Additionally, there have been over twice as many cops victimized by fatal shootings in the first three months of 2016. It should also be noted that, contrary to 50 years ago, the United States has many more minority police officers. They get shot, too. Master Sgt Debra Clayton lost her life on duty in Orlando on January 9, 2017. She had served 17 years as a law enforcement officer. was gunned down Monday morning near a Wal-Mart on John Young Parkway and Princeton Street in Pine Hills while confronting 41-year-old Markeith Loyd, who is wanted for murder. “Markeith Loyd is a suspect this community is familiar with. He should be considered armed and dangerous. He is a suspect in the murder of a pregnant woman in the jurisdiction of the Orange County Sheriff Office,” [police chief John] Mina said. Dixon’s brother, Ronald Steward, was also shot and critically injured when he tried to come to her aid, investigators said. It gets no realer then me,like it or not I’m go keep it 1,000…. I wear no mask,what you see is what you get..
A witness to the shooting said the gunman was wearing a shirt that read “security,” but Mina said Loyd was not a security guard. Clayton was outside the Walmart when she was approached by a shopper, Herman said. May Master Sgt Debra Clayton rest in peace. My condolences to her many friends and family at this difficult time. What this goes to show is how complex — and dangerous — law enforcement is. I have not been the greatest supporter of the police in the past, but reading about these recent cases has given me pause for thought. Perhaps others feel the same way. It’s easy for us, so far away from the line of fire, to criticise people who put their lives on the line every day for our safety. Whilst it is wise to refrain from labelling an attack ‘terrorist’ until we have the facts, the media are distorting and denying various aspects of the recent attacks in Europe, particularly Germany. Foreign Secretary Boris Johnson came under attack from The Guardian and Liberal Democrat foreign affairs spokesman Tom Brake for saying that the recent Munich mall attack on Friday, July 22, was related to terrorism. If, as seems very likely, this is another terrorist incident, then I think it proves once again that we have a global phenomenon and a global sickness that we have to tackle both at the source – in the areas where the cancer is being incubated in the Middle East – and also of course around the world. That quote comes from the same Guardian article that accuses Johnson of jumping the gun in labelling the Munich incident as terror-related. Nine people died. The attacker, an 18-year-old German of Iranian extraction, then killed himself. Since then, the name of the attacker — Ali Sonboly — has been distorted to David Ali Sonboly. That is a BBC link, but I have also seen it on other news outlets where it sometimes appears as Ali David Sonboly. Thankfully, a BBC viewer tweeted in response that the perpetrator’s name is, in fact, Ali Davood Sonboly. Note the progression from Ali Sonboly to David Ali Sonboly or Ali David Sonboly, when his real name was Ali Davood Sonboly. You know, we cannot call this what it is or call the attackers by their right names because people might be offended. The result will be that low info viewers, of which the BBC have many, will be under the impression that this lad was someone he wasn’t. These viewers take the BBC at their word. I know a lot of people who believe that BBC reports are completely trustworthy because they were 40 or 50 years ago. Folks, the BBC have moved on since then, ever leftward, ever economical with the truth. Their report on Debbie Wasserman Schultz’s resignation on Sunday, July 24, was but another example. On July 18, three days before Sonboly’s attack in Munich, another adolescent — an ‘unaccompanied’ 17-year-old Afghan asylum seeker who had been living with a foster family in Germany — went on a rampage on a train in northern Bavaria. He took an axe and a knife to 20 passengers. Three were seriously hurt and one sustained ‘light injuries’. All four were from the same family — tourists from Hong Kong who had been enjoying a delightful holiday prior to the attack, including the wedding of an immediate family member in Britain. “Allahu Akbar” before the attack and investigators believed he had a become ‘self-radicalised’ Muslim. Although police have yet to confirm his identity, a video released by ISIS claims to show him delivering a speech in Pashto to the camera while holding a knife. The video calls him ‘a soldier of the Islamic State who carried out the Wurzburg attack’. The video appears to show Riyad saying he would ‘slaughter infidels’ with the knife he holds up to the camera. He says: “I am a soldier of the caliphate and I am going to carry out an suicide attack in Germany. The rest of the quote is at the link. A Shanghai paper has more information with links to other media reports. On Sunday, July 24, a 21-year-old Syrian refugee killed a 45-year-old pregnant Polish lady with a machete in southern Germany. He argued with her around 4:30 p.m. then hacked her to death. He also injured two other people. German authorities imply it was a lone wolf attack, nothing more. They also said that others in the vicinity should not feel threatened. The man is in police custody. Deutsche Presse-Agentur reported on Monday that the two were colleagues and worked in a restaurant. Authorities are unclear when the man arrived in Germany. This was the third act of violence in Germany within 10 days. it was likely the attack was the work of an “Islamist” suicide bomber. Bavarian police said it was unclear if the attacker was Islamist. The attacker was due to be deported to Bulgaria and had received two deportation orders, the most recent of which was on July 13. Bulgaria was his first safe country of entry. Patrons of the wine bar were initially told the explosion was caused by a gas leak! Pity Bavaria, which has had to take in so many refugees and migrants, particularly during the past year. When Germany’s Willkommenskultur (welcome culture) was still in full swing, its advocates argued that Isis would not dare to target a nation that generously opened its borders to those in need. They also thought refugees coming to Germany would feel such enormous gratitude that they couldn’t possibly turn against their host country. Truth be told, I thought so too, but it doesn’t sound right any more. The refugees who entered Germany had high hopes. Smugglers told them they’d prosper and find jobs instantly. Now they are languishing in asylum-seeker centres and struggling with bureaucracy, uncertain whether they can stay at all. Many of them are young men who are homesick, angry and frustrated, and extremists are deliberately visiting their homes because they know they are fertile ground for recruiting. … advocates of Willkommenskultur have been on the losing side of the public debate since the events that unfolded in Cologne on New Year’s Eve. They’d be well advised to acknowledge that the open-door asylum policy was overly idealistic, and that they underestimated some of the challenges posed by mass migration. Meanwhile in France, a policewoman in Nice is at loggerheads with the French government over a report a central government department asked her to prepare concerning the attack on Bastille Day, July 14. In an interview to a Sunday newspaper, Sandra Bertin said she was in charge of the CCTV room that night. She did not see any national police on duty where the lorry entered the Promenade des Anglais, where the attack with the lorry took place. Local police were unarmed. Bertin says that had they been better armed — like the national police — they would have had a decent chance at stopping the lorry by shooting at the tyres. National police were stationed further along and were able to stop the lorry by shooting at the windscreen. By then, for 84 people, it was too late. The next day — Friday — Bertin filed a report, by request, to the CSU (Centre for Urban Supervision), a department of the Interior Ministry but not that of the Interior Minister himself, Bernard Cazeneuve. Bertin, who, incidentally, is secretary general of a Nice public servants union, sent her report electronically. A few days later, the antiterrorist branch visited her office requesting that she destroy the CCTV tapes she had from that night. She said in her newspaper interview that was because they feared the public might see the tapes. Officials in Nice have refused to destroy them. Paris public prosecutor François Molins, whose office is overseeing the investigation, says that the officials visiting Bertin’s office only wanted to see the evidence for themselves. Interior Minister Cazeneuve said he and his office had no direct involvement in these events. Bertin might be asked to submit to questioning by him or a representative. Even worse, he is suing her for defamation over ‘serious accusations’ she allegedly made against him. There is a party-political aspect to this. The administration is Socialist. The Agglomeration of Nice is run by the right-of-centre Les Républicains, led locally by Nice’s long-time mayor Christian Estrosi. From the off, Estrosi said the police protection was woefully inadequate on July 14. Honest reporting. It will be interesting to see what the major French newspapers say. Let’s hope they do not name the attackers ‘Antoine’ and ‘Jean-Pierre’. Except if it is Maxime, as in Maxime Hauchard, now Abu Abdullah al-Faransi, who — possibly still in Syria since 2013, according to The Mirror — indirectly collaborated in this gruesome act with Adel Kermiche, according to the Daily Mail. L’Internaute had a live column of what happened in the immediate aftermath. The priest was 86-year-old Revd Jacques Hamel, ordained in 1958. Someone would have to be pathological to murder an elderly priest, especially in such a horrifying manner. A nun who was helping him at the altar was seriously injured. Some of the other hostages also required medical treatment. Police told those living in the immediate vicinity to stay indoors. Word of the attack soon reached those at the Catholic World Youth Day events being held in Krakow. The Pope, who is in in the Polish city, expressed his ‘pain and horror’. Archbishop LeBrun of Rouen returned to France and his Vicar General took his place in Krakow. The Vicar General went to the scene of the attack immediately. François Hollande and Bernard Cazeneuve arrived shortly afterwards. The live report states that this church was on the target list of Sid Ahmed Ghlam, 24, the extremist who intended to murder Catholics coming out of Sunday Mass in April 2015 in suburban Paris. Instead, he murdered fitness instructor Aurélie Châtelain who was in her car consulting her computer in Villejuif, just outside Paris. Then Ghlam ran into a spot of bother. He accidentally shot himself in the leg and was bleeding profusely. He drove his own car for some distance, before ringing the emergency services! Police arrived on the scene and arrested him. I wrote this shortly after the attack. More news has emerged, notably that one of the attackers, who wore an electronic tag, was allowed to roam freely on weekday mornings. The tag was switched off as usual before he left his parents’ home the day of the attack. The Telegraph has a live column, and other news outlets around the world have rightly given this story the attention it deserves. These issues with the media and state security forces affect more countries than Germany and France. Belgium’s security police and intelligence departments also have their problems. The media, however, would do well by telling people the truth. One month after the Charlie Hebdo and kosher supermarket attacks, censorship is returning to normal. Before getting into specifics, it’s worth recapping why the late Stéphane ‘Charb’ Charbonnier and his editorial team adopted the policy they did. Until the Danish paper Jyllands Posten published the controversial cartoons of Islam’s prophet in 2005, Charlie Hebdo took religious potshots largely at traditional Catholicism. Once the furore of the Danish cartoons followed, the Charlie Hebdo team shifted their attention accordingly, although they still ridiculed Catholicism and Judaism and equally as crudely. If we start saying ‘we can’t draw Mohammed’, then we won’t be able to draw Muslims at all. If we yield on even one detail, freedom of expression is finished. If we take into account the context, the global context will never be favourable with regard to laughing at radical Islam or religion in general. If we take context into account, we won’t be able to talk about anything, ever; the satirical press will be condemned and stuffed. It is essential to remember that Charlie Hebdo drew vulgar cartoons about all three main religions, never just one. It is interesting to note that, around the time of the attacks, in Nice, a Muslim snack shop owner’s premises was destroyed. He made the grave error of selling ham and butter sandwiches. He is determined to reopen his business. The first weekend in February showed the extent of British censorship. Before detailing what happened, readers should note that only a handful of media outlets — one magazine, two or three newspapers and one or two television news stations — showed any Charlie Hebdo cartoons, mostly the poignant cover of the mid-January issue. Those who showed more understandably shied away from the most controversial drawings. Similarly, Charlie Hebdo is not normally sold in the UK. Two press distribution companies ordered 2,000 copies of the mid-January issue to sell on to independent newsagents. Two or three shop owners were featured in the newspapers; the owners said that customers could order copies through them. However, the majority did not advertise the availability of the magazine. However, two days later a member of Her Majesty’s police service visited said newsagent, requesting the names of the four customers who had purchased Charlie Hebdo. So beware, your badges may attract police interest in your customers. I am reassured that the force have taken the right action and permanently and securely disposed of the information gathered. I am satisfied that there was no intention on the part of the force to seek to inhibit the circulation of Charlie Hebdo. Concerned readers commented on the article. The most frequently mentioned concerns were whether the customers’ details really were permanently deleted and how many other counties in Britain also saw police visits to newsagents. On Tuesday, February 10, the paper published a second article which revealed that officers in Wales and in Cheshire also questioned newsagents about people who ordered Charlie Hebdo. These newsagents did not reveal the identity of their customers and found the situation worrying. Quite what they think they’re doing and why they are wasting police time tracking down individual readers of Charlie Hebdo, really makes you wonder what sort of counter-terrorism and security policy those police forces are pursuing. It also has to be said that when police forces check up on what you are reading it’s unsettling in a democracy. I’m quite sure it’s not intentionally so, but it is unsettling and not something you should do lightly. Agreed. However, as our police have probably not seen the magazine, they do not quite understand what it is about: satire, nothing threatening. The article went on to say that the Metropolitan Police have not been asking London newsagents for any details of customers ordering Charlie Hebdo. Furthermore, the national police organisation ACPO has not issued any general guidance on this issue, either. Thankfully. However, on February 8, a group of 1,000 Muslims demonstrated in Whitehall and presented a petition signed by 100,000 more to No. 10 Downing Street. No doubt this is to request some sort of censorship regarding representation of their religion. It is unfortunate for the Pope that several placards carried his quote about violence towards anyone who might criticise his mother. No British publication has ever created or reproduced characterisations of the prophet in question. Nor would they. The protestors would have done better to travel to Paris and protest at the Elysée Palace under the auspices of a local Muslim association. Meanwhile in France and Belgium, censorship continues apace. Marianne (Issue 929, February 6-12, 2015, pp 34-36) has an article on various artistic exhibitions which have been cancelled or postponed. At home. Without bothering anyone. Television: Guillaume Meurice, the presenter of the humour segment on Canal+’s La Nouvelle Edition, stood down after the channel’s executives refused to let him show and comment on a Charlie Hebdo cartoon. Parti Socialiste: The French Socialist Party (PS) has been conducting a Twitter campaign, Faire Vivre la Republique: Bring the Republic to Life. They invited the famous illustrator Xavier Gorce to contribute a drawing. His anodine illustration of a woman in a burqa upset many Tweeters who saw it. The PS promptly removed it with no further explanation. People in the street are afraid. Everyone yelled at the top of their lungs ‘Je suis Charlie’, but when it comes to taking action, no one’s around. Museums: In the Paris suburb of Clichy-la-Garenne, an art exhibition is taking place. However, one of the exhibits — Silence — has been withdrawn. Silence, created by the Franco-Algerian Zoulikha Bouabdellah, is an art installation which features 24 prayer mats, each with an identical pair of luxury white high-heeled shoes in the centre. A local Muslim group asked for its withdrawal saying that it could provoke ‘irresponsible incidents’. Meanwhile, in Belgium, the Hergé Museum, largely devoted to all things Asterix, has cancelled a tribute to Charlie Hebdo. The museum’s directors feared being ‘fired upon’. Charb was right. Who knew such censorship would happen so soon? This final instalment on the events of January 7 – 9, 2015, looks at two of the three police officers who were gunned down during that time in Paris. Clarissa Jean-Philippe had only been on the beat for 13 days when Amedy Coulibaly shot her in Montrouge, south of the city, on the morning of January 8. Her body was flown back to Martinique, where she was born and raised. Her funeral took place in the town of Sainte-Marie at Notre Dame de l’Assomption church on Monday, January 20. The Mass was concelebrated by the Archbishop of Martinique, the Vicar General and her parish priest. A large group of French and regional ministers from Martinique, Guadeloupe and Guyana filled the church, decorated with a hundred floral wreaths from various organisations and community groups. Bishop Michel Méranville reminded the congregation of the tremendous risk and pressure the police, emergency services and firefighters were under. My prayers go to her family and friends, but particularly her mother. It cannot be easy burying a child, especially in such circumstances. Charb’s officer, Franck Brinsolaro, died whilst trying to protect him on January 7. Flexibility, discretion, he has to learn the language and habits of ‘his’ well-known public figure — that’s what they say, often affectionately, of those whom they protect. From morning to evening, they follow them, accompany them. Seventeen-hour days where they share with ‘their’ VIP the close confines of a car, but also a conversation, sometimes a meal. We’re in that inner circle, we go on holiday with them, we know their families. With ‘my’ public figure we no longer need to say anything, we know what each other is thinking. It’s a bit like miming. Sometimes, I wonder if I’m the one working as an officer and they’re the ones running Charlie Hebdo. They do not necessarily look like bouncers or minders. Le Monde said that only the Glock they carry distinguishes them from anyone else. an understated and discreet man who adored his work. My prayers go to her and her family in the months ahead. Are some Belgian policemen supporting terror? Belgium has made a worrying discovery inside its police departments. I do not think the organisers of this crime are French authorities but that they did allow this crime to be committed. For the moment, these are only suspicions. On Sunday, January 18, Le Monde reported that several searches took place that day in and around Brussels. A known terror cell broke up the week before, its leader still at large. Belgian authorities say this group planned an attack on police on January 16. Investigations continue. police officers suspected of having links with radical networks. The wife of another police officer had adopted conduct suggesting she was sliding into extremism. A third officer refused to shake the hands of his female colleagues. Belgium is under considerable tension at the moment, particularly in Brussels and in Anvers, where armed troops are patrolling high profile areas. At least one Le Monde reader asked about infiltration in the armed forces. It is not inconceivable that extremist cells are conducting a long march through European institutions.